Players look forward to breaking in new soccer shoes at the beginning of every season. This is necessary to mold quality leather shoes to your feet over the life of the shoes. Top-end kangaroo leather, thin yet strong, makes an ideal soccer shoe upper to take the shape of your foot. These shoes require care and preparation before you can use them in live game play. Purchase soccer shoes that are a half size to a full size smaller than what you normally wear. Check that the shoes are made of leather that will stretch to mold to your feet. You want the leather to hug the curves of your foot so that you have a better touch on the ball. Wear the shoes on soft grassy ground with the same equipment you would wear in a game. 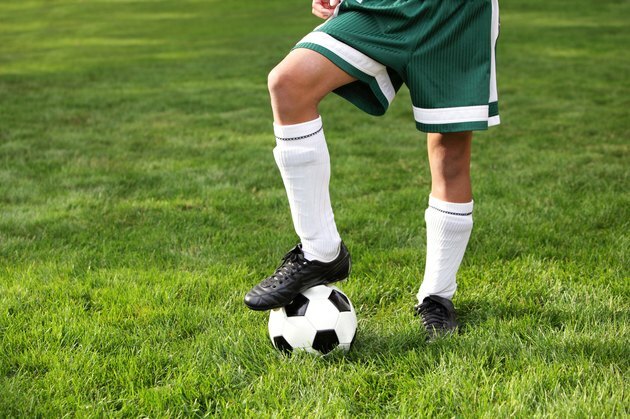 Put on your soccer socks and shin guards, so that when the shoes start to take shape, they will form to the shape of what your foot will look like during the game. Do light exercises, such as walking, jogging, dribbling and juggling to begin to break in the leather. Shower with your cleats and soccer socks on. Use warm water, as this will help to loosen up the leather. Keep the shoes on as they begin to dry, as this is when the leather will begin to form to the shape of your foot. Stuff the inside of the shoes with balled-up newspaper when you take them off, which will absorb excess water and retain the shape of the shoe. Rub petroleum jelly or leather food onto the uppers to keep the leather soft and help prevent the formation of blisters. Wear the shoes to practice before wearing them for a game. Bring an extra pair, so that you can wear the new cleats for a short period of time and then switch out of them. It will be much more difficult to change cleats if they begin to create blister during a game as opposed to a practice setting. Allow your cleats to dry naturally. Take them out of your bag between practices but do not leave them in direct sunlight. Take your cleats off if you start to feel a blister. Work more leather food into the area of the shoe that is giving you trouble to help prevent painful blisters.